I did it!!! I finally made all 9 of the swing cards on the Artiste cartridge. 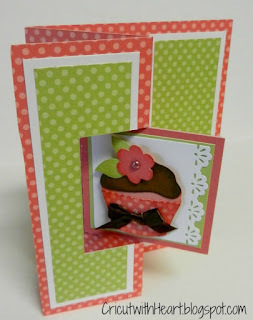 Everyone has been loving these cards and I have been having so much fun making them. For this card I added the cupcake from page 69 cut at 1 3/4 inches and the flower and leaf combo from page 32 cut at 3/4 inches. 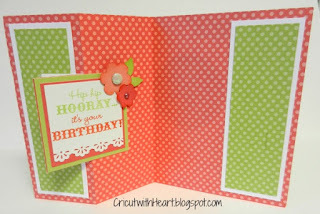 I used another sentiment from the Card Chatter-Birthday stamp set. I hope you like it! Love this card! Although at first I thought the bow was a mustache haha. Gotta get some better glasses. I have stared at this card since you posted it. 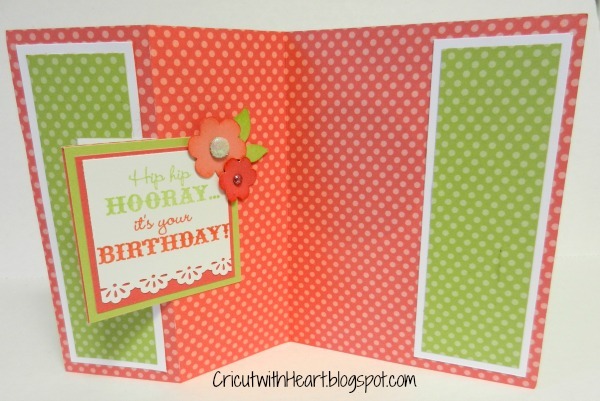 Did you cut 2 cards in Dotty For You and glue them together so that it's smoothie dot on both sides? It doesn't look layered but I'm sure it is! Beautiful and inspiring card. 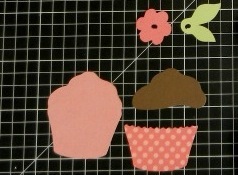 I am wondering if you have a cheat sheet for the cut sizes of the "swing" pieces when you make an A2 sized card? The square and circle are basic enough to figure out, but the other ones I am having a difficult time with, suggestions are welcomed.